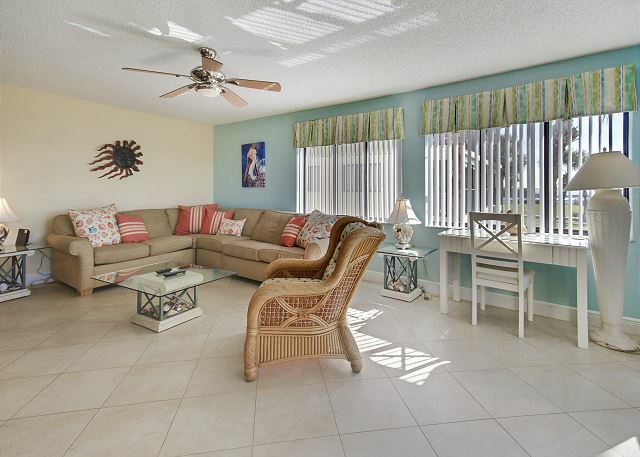 Open and airy with lots of beach front charm. 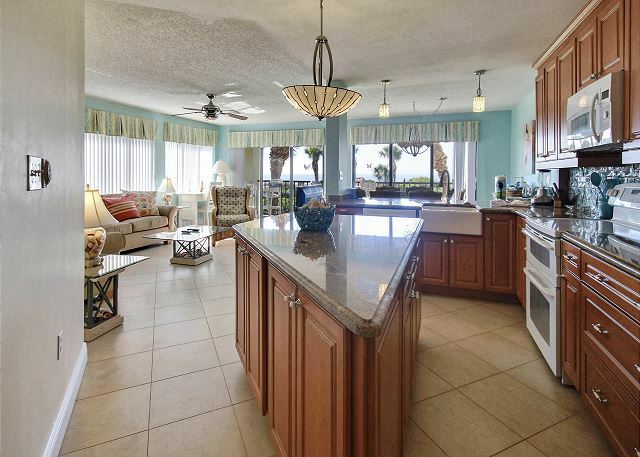 This large south corner condo has everything you need for a perfect vacation. It is completely remodeled.... 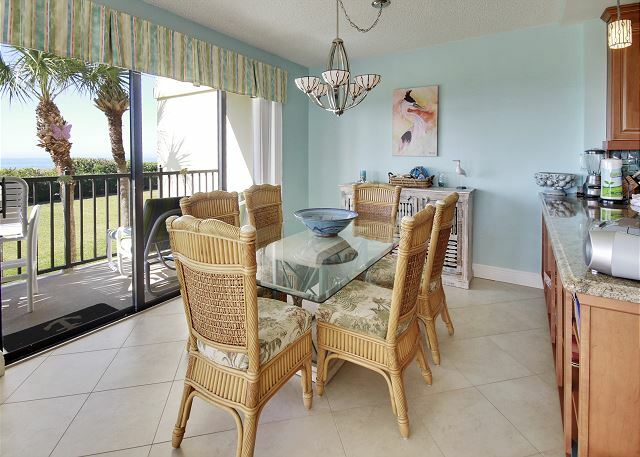 Rows of windows open the space to an expansive view of the Gulf of Mexico from the living room, dining area and the kitchen. 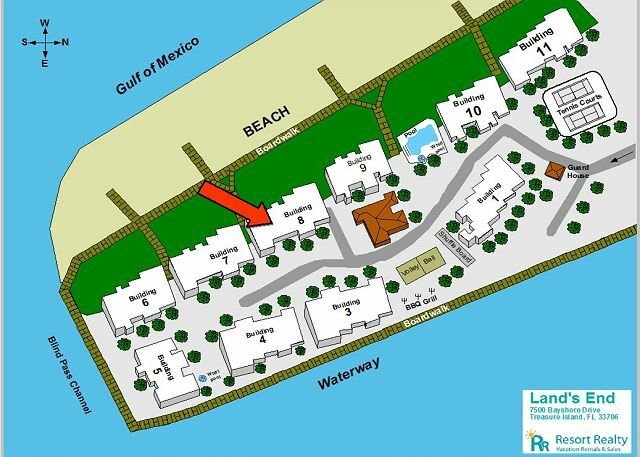 Located in the popular Sunset Beach neighborhood, this lovely condo has a fully equipped kitchen and comfortable décor. 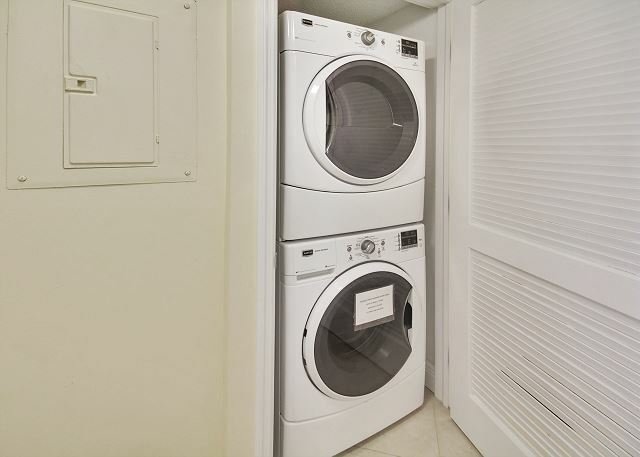 Full Size Washer and Dryer for your use! 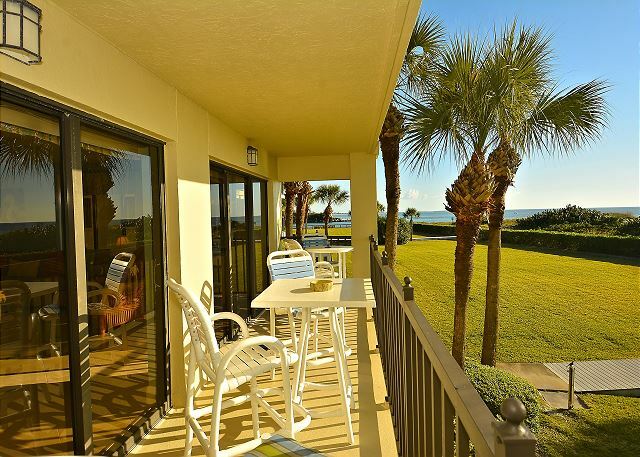 The double size balcony facing the Gulf is a great spot for watching the glorious Florida sunset. Free wireless Internet. 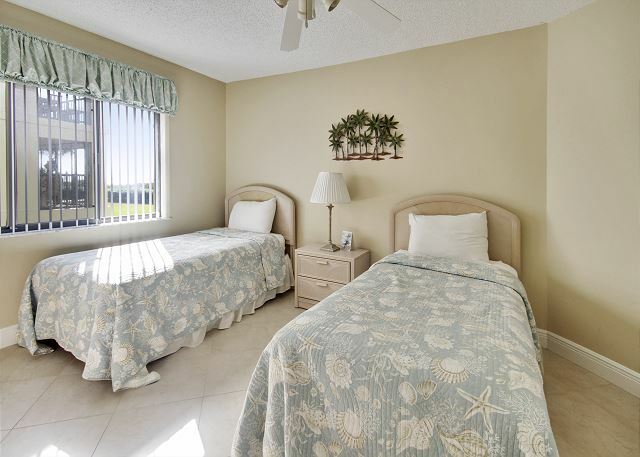 This is a corner unit which has a great view and is very spacious. 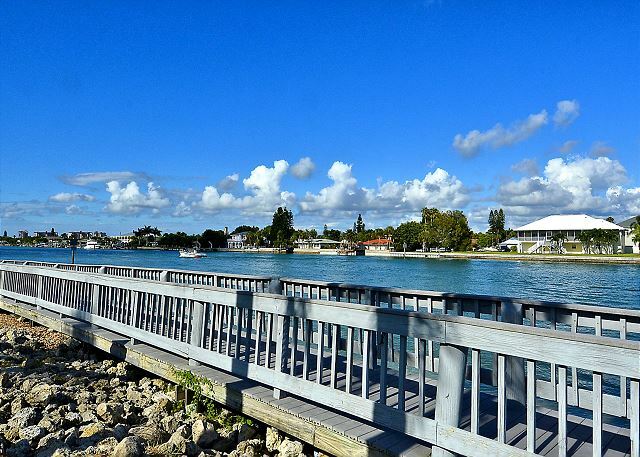 Land's End has a wonderful boardwalk that runs from the beachside to inlet side and back to the beach giving you the option to walk the beach or stay on the board walk. sunsets are spectacular from inside or from the deck. We were never wanting for items from the kitchen, livingroom, bathrooms or bedrooms. We even had a great supply of beach chairs/toys/umbrella. A very relaxing and fun time was had by our entire party as we celebrated another beach time birthday! We were very pleased with this end unit condo. Everything we needed was available in the condo. The balcony is a perfect place to view sunsets and have happy hours. I would rent this unit again. Awesome, so glad you were comfortable and enjoyed this premier beachfront condo!! Thank you for choosing to stay with us and we look forward to your next visit. We booked our stay at Lands End during the winter months through Resort Rentals and received an email in May notifying us that the condo was undergoing balcony renovations but they should be done by our week of vacation. As the week neared we received notice that rain had delayed completion of the work and we wouldn’t have a balcony. 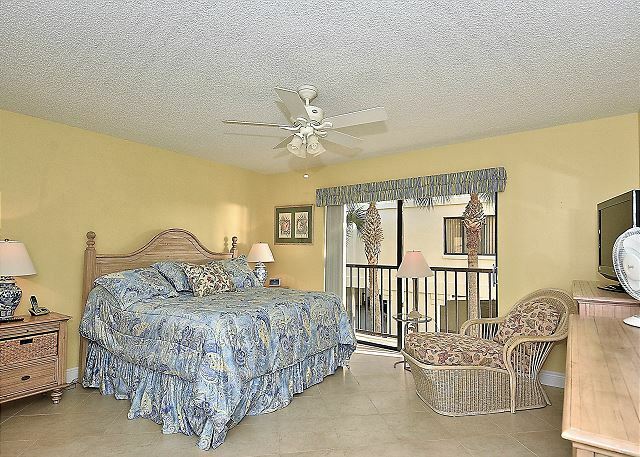 Janet from Resort Rentals was able to find us another unit with a functional balcony at the last minute! They even gave us a discount for our trouble (and construction noise). The unit was beautiful and we had an enjoyable time in spite of everything. Thank you Resort Rentals and Janet for your hard work and communication throughout the entire process! Nice condo away from home with nice walking areas. Everything was great, except that there was constant sawing noise below us in the garage and by the elevator from early in the morning till late afternoon from condos being refurbished that were a few condos away on another floor, but they chose our floor, and below us to work on cutting tile, wood, etc. It was not peaceful!!! Why can't they work were the condo they are refurbishing is?? The place was clean, except the floors, but was told that was common for a lot of the condos. They were better than last time. We just brought black socks. The bath in the master bedroom still only had lukewarm water, and the tub would bearly drain, so you are always standing in several inches of water, but it was like that last year too. Reported it again to office. The place was nice, other than those things, the first which is out of the owners control. We were told that they would be doing more renovations to the exterior balconies, etc. in the near future. We are so sorry for the construction that was taking place while you were at Land's End, we definitely understand that frustration!! Unfortunately there are owners that will have some updates and work done to their units and if they are not a part of our rental pool, we are normally unaware of the work that takes place. We truly apologize for the noise disruptions that you experienced. We will take a look at the other items that you had listed here. Thank you for staying with us and please do not hesitate to contact us prior to your next stay and we of course will share with you any work(s) taking place that we are aware of. We hope to have you back for another beach vacation in the future. we certainly come back next year if possible for one month . Lovely condo with a perfect location. Ocean view from balcony and intercoastal on 2 sides of the resort. Great pool! Thank you for the post!! 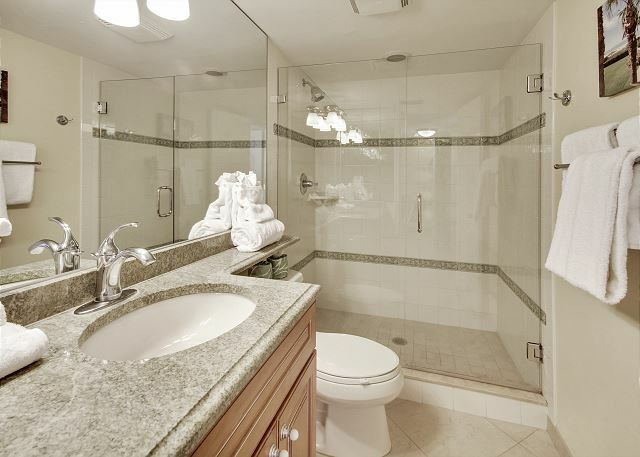 We are so glad you enjoyed your stay in this premier condo at Land's End, the views here really are amazing! 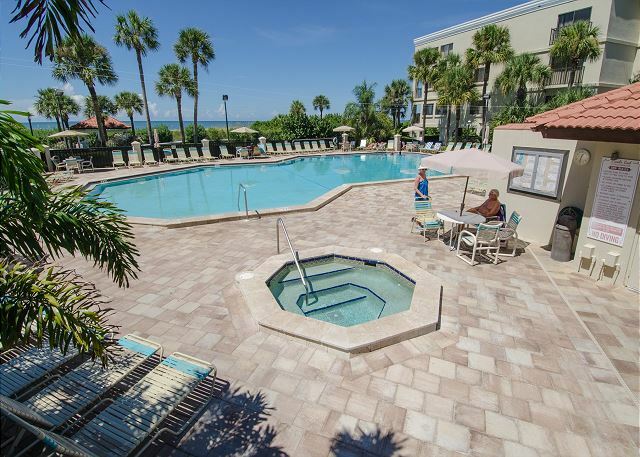 :-) Thank you for being our guest and we hope to host your next FL beach vacation! Beautiful well maintained property. Top choice for who likes sea sand sun and tranquility. The condominium we rented was very clean, nicely furnished and with a unique panorama. We come back next year. One of the best at Lands End that we have had.I say this as we have been there many times. Thanks for the post! This is one of the condos that fall into our premier category of units, meaning it carries recent updates. We are so glad you enjoyed!!! :-) We look forward to seeing you back at Land's End again soon! 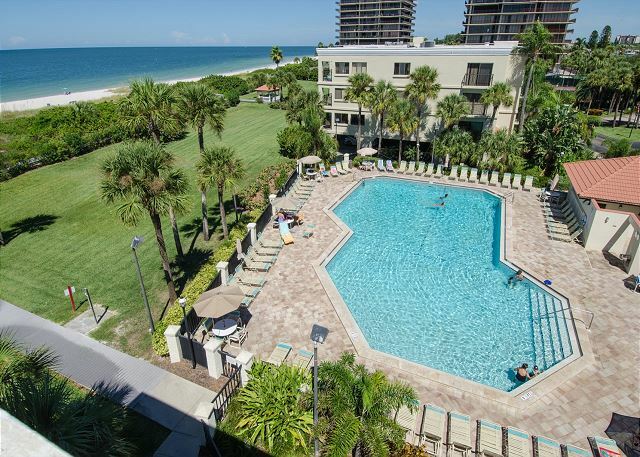 we rented again this condo for 2 weeks because, last year, we were very satisfied: beautiful location and view over the beach front, good quality and tasteful furniture, well-maintained amenities. For our convenience and for the first days, we would like to find some cleaning products, salt, pepper, etc in the condo, as it was the year before. Great property on a quiet beach. 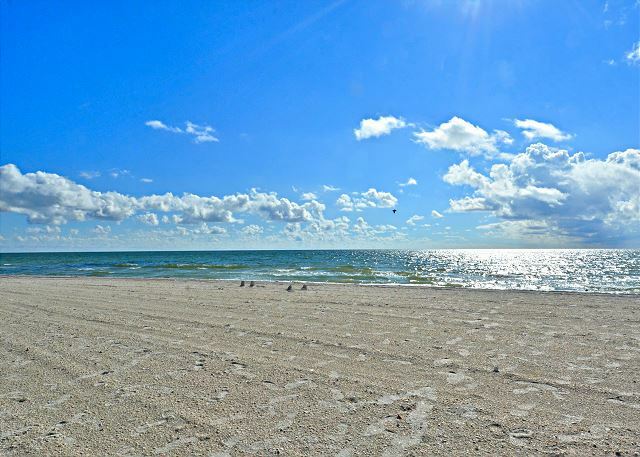 You basically have the beach to yourself as the inter-coastal waterway cuts off traffic from the South and St. Pete Beach. Condo was updated with new flooring and furnishings. It had nice high-end appliances and features. 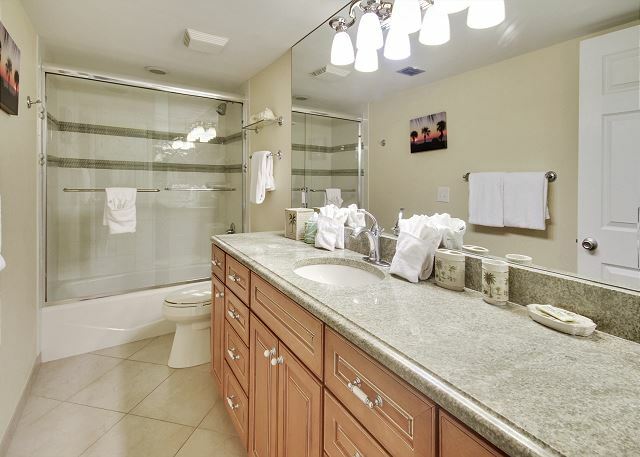 A very nice modern condo with great decor, a beautiful remodeled kitchen and great appliances and cookware! Unit was exactly as it was portrayed. Clean and perfect location. Excellent stay. Lands' End is a beautiful place to stay. Love it. Condo is perfect! Fully equipped for a wonderland beach vacation. Very Clean! We have just returned from a wonderful week at Land's End. The condo we rented was excellent. Super clean, beautiful, wonderful views, excellent furniture and beds, well equipped, etc.. Just cannot say enough good things about the property. The grounds , beach and pool area are among the best I have experienced! Overall an extra special vacation! This is a lovely location. 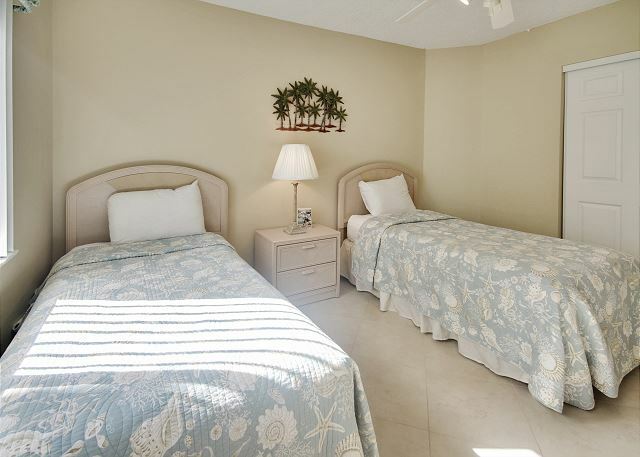 Our condo had a great layout, with a very well appointed kitchen and comfortable furniture. The beach was wonderful, warm water and beautiful white sand. We had a bit of an issue with the pool worker rules forbiding my kids the use of floats while other kids had them. We were threatened to be evicted unless we complied, so we did, but kids' safety should come first and all guests treated the same. Anyway, we decided to spend more time on the beach and less at the pool so my kids could use their floats and play safely. Thank you for your review. I am glad to hear the condo and our beaches were to your liking. I am sorry for the experience you encountered while at the pool. I will pass on your comments to the Lands End Management Association so they can address it with their staff. I do know that arm floats, noodles and other life preserving type items are permitted in the pool but regular floats are not. Again I apologize for the way the situation was handled and do hope you will stay with us again in the future. 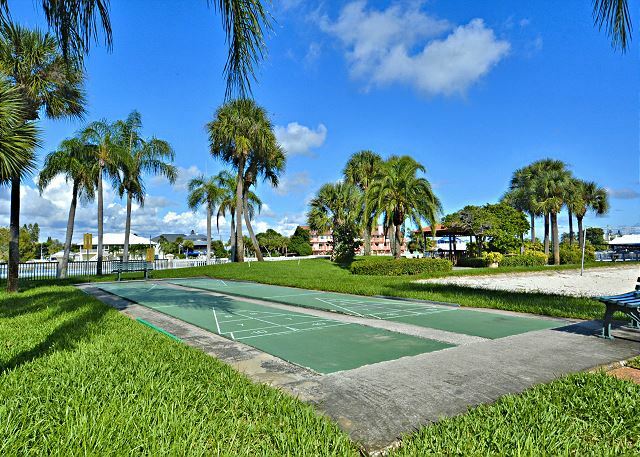 Excellent location, great beach & pool. The place we stayed was better then any we have stayed at in Lands End. We will be back. 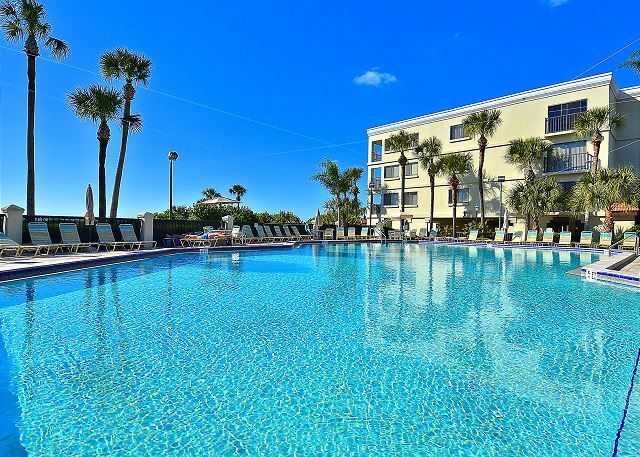 this is a beautiful condo complex to stay in. will be returning next year. it doesn't get any better than this. We love Lands End and our unit. Love the area, restaurants, the view--great sunsets, etc. Appreciate owners providing new furniture for master bedroom. We now have a lot of storage. Kitchen is well stocked with just about all food prep items. Great amenities with one suggestions--since floors are now tile replace sweeper with electric sweeper broom &/or Swifter or Steam mop. RR needs to insure that cleaning company does inside as well as outside of stove/oven. Check wiring for ceiling fan/light-- it turns off & on it's own. So looking forward to going back in 2015!! I've stayed at LANDS END 5 times and this unit 3 times,and was very happy this last time because it was recently upgraded,wow what a place all new kitchen, new living room and its very comfortable, and new mattresses in all the bedrooms,slept like a baby.Now for the complex(lands end)LOVE this place.Big pool and plenty of recliners for everyone,and its never crowded always peaceful.If your thing is the beach well the complex is right there on the gulf,walk out of your unit and into the beautiful beach in seconds.Also our unit had beach chairs and umbrellas, but i don't believe the beach equiptment is a standard offering in the units,we got lucky.When its time to eat ask the locals,there is no shortage of good restaurants in the area. Now book your stay and ENJOY. 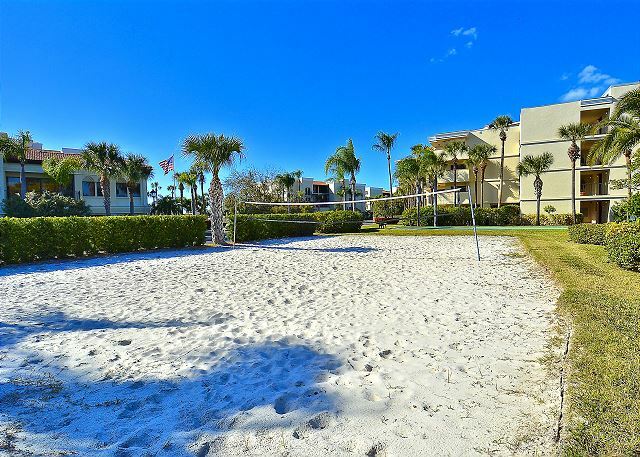 Beautiful condo and area!! We didn't want to leave! We have stayed at Land's End twice and both times everything was great. Looked forward every morning drinking coffe on the balcony. Only problem Ants were in the Kitchen . We loved 201 building 8. This is a great condo in an excellent location. It is right next to the beach. The views are outstanding, including beautiful sunsets. Place was beautiful and well kept. Everything was clean and in good condition. I will be going back. Snowbirds Find a Little Piece of Heaven at Land's End! Being newly retired this was our first experience as 'snowbirds'. So glad we chose Treasure Island and especially Land's End. The view of the gulf from our condo and nightly sunsets were awesome as was the weather. The grounds are beautiful and well maintained. Loved the very clean heated pool, the hot tub and the pool area--where we met a lot of great people who we hope to see again next year. 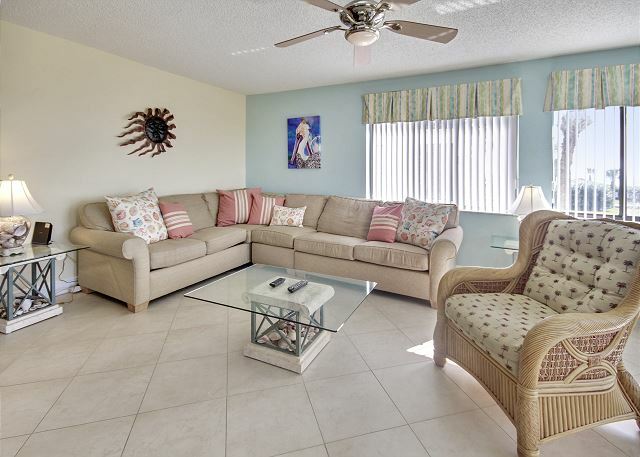 Our condo which was newly remodeled was just perfect..great color scheme,very nicely decorated, new ceramic tile floors, granite counter tops, tasteful and comfortable furniture especially the new king mattress in the master bedroom. Whoever stocked the kitchen and planned layout did a great job. Only 2 things that we would suggest they add: #1 the master bedroom needs a dresser for clothing storage. We were forced to hang all of our clothes. #2. With all the floors being tile, they need to provide something that adequately cleans tile floors.. possibly a sweeper broom and/or a Swifter rather than a huge cumbersome Dyson sweeper which just didn't do the job. Over all, we were very happy with our condo and Lands End and look forward to returning next winter!! we stayed 4 weeks in these complete renewed condominium (ceramic tiles instead carpets, new kitchen with new appliances, baths renewed ,...). A very great pleasure for us to came again. We were very satisfied with the general conditions! My family and I enjoyed our stay in this unit. Loved that it had such a large common area so we never felt cramped with 4 adults. 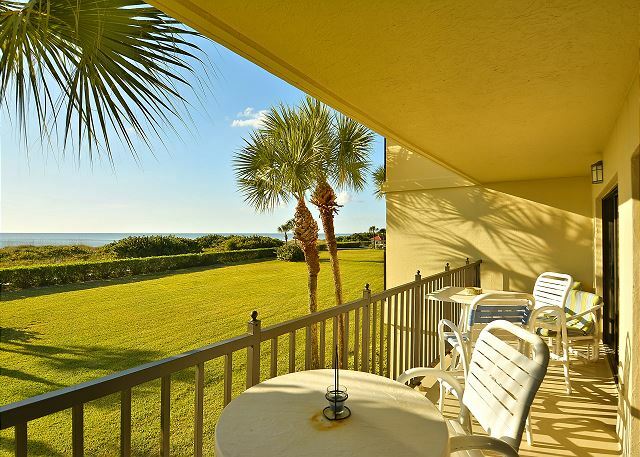 The long balcony was used for relaxing, playing cards, sunning and watching the beautiful sunsets. The unit itself was clean and had nearly everything we needed for our week. (Lids for the frying pans would be helpful but we managed.) I brought a beach chair with me because I drove but it would be nice to have them made available for those who flew to FL. We were impressed with the care taken on the outside of Land's End too. Beautiful landscaping and well cared for. Enjoyed the boardwalk and the beach was perfect for my mother who can't walk too far...some of the beaches are so wide she'd have had a hard time getting to water's edge. We enjoyed the shopping area on Corey Ave. and were happy to see that the Beach Theater is still there. We ate in and also enjoyed a dinner at PJ's for a little break. Everyone I spoke to at Resort Rentals was friendly, professional and very helpful. All was well. GTreat spot / location. Have been returning for about 4 years now. Thanks. Home and location in good shape. Very satisfying! May be, some more dishwasher detergent could be more convenient. This particular unit is a corner condo and a bit bigger which makes it very desireable and comfortable. 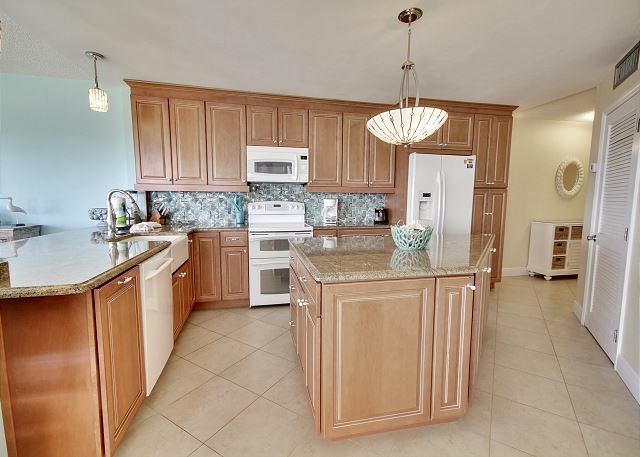 However, the condo is a bit dated and the kitchen is not in great shape....should be updated a little. Also the carpet.